From the cover of the American edition of My Struggle: Book Four. 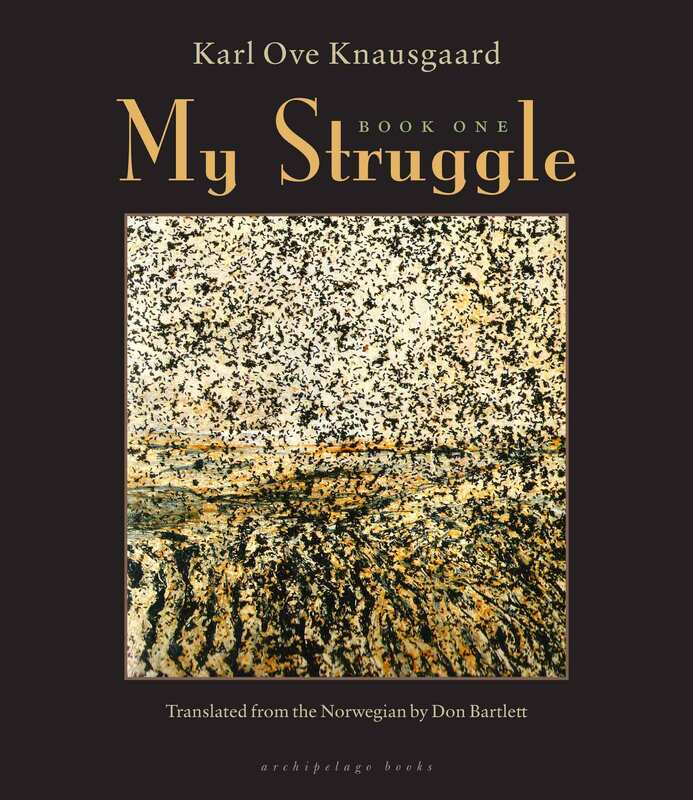 The fourth of Karl Ove Knausgaard’s six-volume autobiographical mega-novel, My Struggle, releases today. But Knausgaard writes in Norwegian, and most of us are reading My Struggle in English. 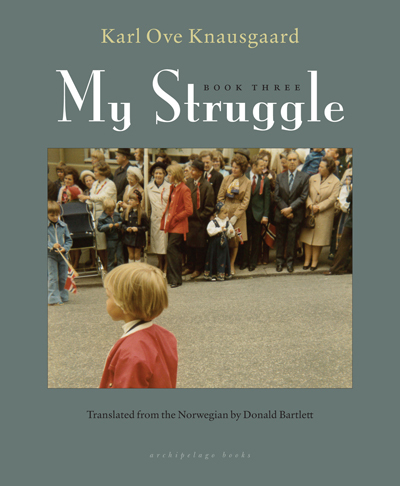 For this we must thank the translator Don Bartlett, who has spent much of the past four years transposing Knausgaard’s Norwegian into an addictive, lively English. I recently had a chance to discuss My Struggle with Bartlett, who, as the book’s translator, is surely one of Knausgaard’s closest, most dedicated readers on Earth. 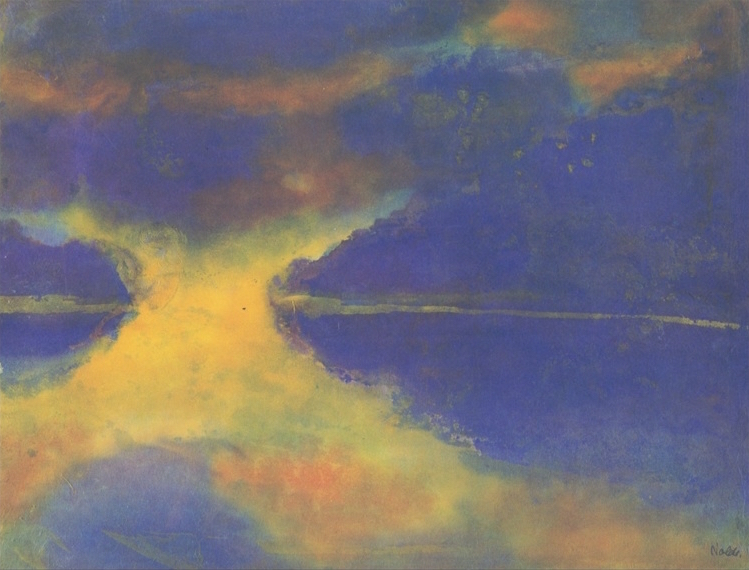 He has been over every single word in the first four books of My Struggle several times; he has weighed commas and clauses like gold; he has scoured for the right voice for Knausgaard in English. 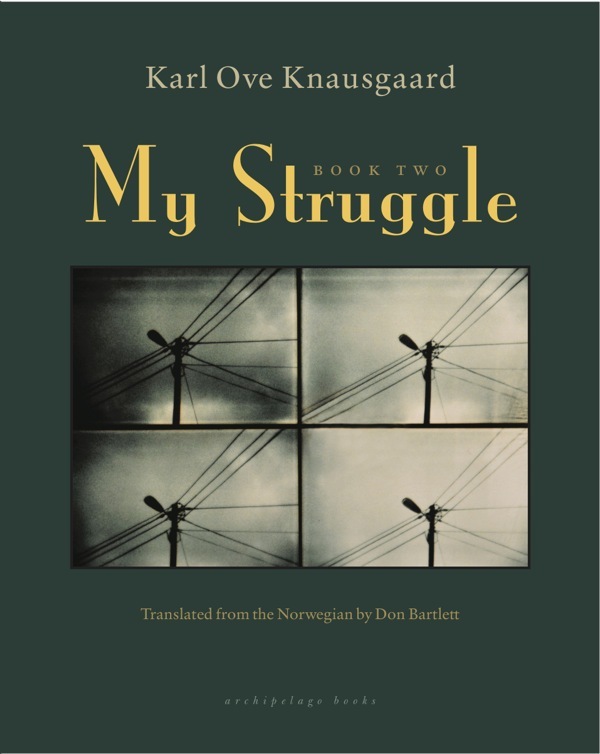 Bartlett, who lives in England, was able to tell me fascinating things about My Struggle—among them, some of the differences between how Knausgaard sounds in Norwegian and English, why Knausgaard seems to sound a tiny bit British in the U.S. editions of My Struggle, and his own theories about why the novels have proven such a success in English. Lots. I think Karl Ove is exceptional at evoking phases of our lives—what it felt like to be thirteen or sixteen or twenty-five. I enjoy the atmospheres he creates and, most of all, the dialogues. I really like those—thinking my way into the characters. And I should add that the challenges of the books, while demanding, are also fun. Poems, jokes, puns, songs, schoolchildren’s writing, samples of his early writing, Norwegian culture, references to art and literature, the openings and endings of the books. There’s no shortage of text types. The intensity of the books, and deadlines, can make you forget that what you do is indeed pleasurable. It’s very striking that My Struggle has caught on so quickly in English. My feeling is that this voice accounts for a good deal of these books’ appeal in translation. How do you explain it? I think Karl Ove has created something exceptional. When reviewers talk about My Struggle being addictive reading, this is indeed what it is. He can make even the most banal incidents interesting. From what I have seen, Knausgaard’s appearances also really help to promote the books. However, Nielsen BookScan shows that only thirty-seven thousand of all three books so far have been sold in the U.K. That’s good for serious translated literature, but it’s probably not cause for wild jubilation among the accountants at Harvill Secker. I want to ask about the points of Knausgaard’s life that he chooses to focus on. Some of them make a lot of intuitive sense—for instance, the death of his father. But then there are other things, like all those pages in Book One about how he manages to get a hold of some illegal beer on New Year’s Eve. Or Book Three, where there are so many memories of him just being a kid. How do you feel about the shape of the series? I suppose a writer has license to roam with memory. What might stick in his or her mind is sometimes arbitrary, sometimes life-shaping. As a reader, you might therefore expect formless novels. However, I am surprised by how well the novels move from elegantly shaped beginnings to natural endings, and how, as a reader, you are only sorry that the narration has come to an end. And there is no overlap, in the sense of redundant repetition, from novel to novel—despite being written with immense intensity and at great speed. The first five novels are very different from each other, the latter three defined by distinct periods in Karl Ove’s life. Book Six, which I have just started reading, appears to be a perspective on what has gone before. Does the shape of the series hold up? I won’t know until I finish Book Six. I think the individual books stand up for themselves. Book Six also mentions that the six books we know might well have been published as twelve novels. That gives force to the idea that the content of the books is elastic. It could have been presented in many ways. You have to view the books as a whole. 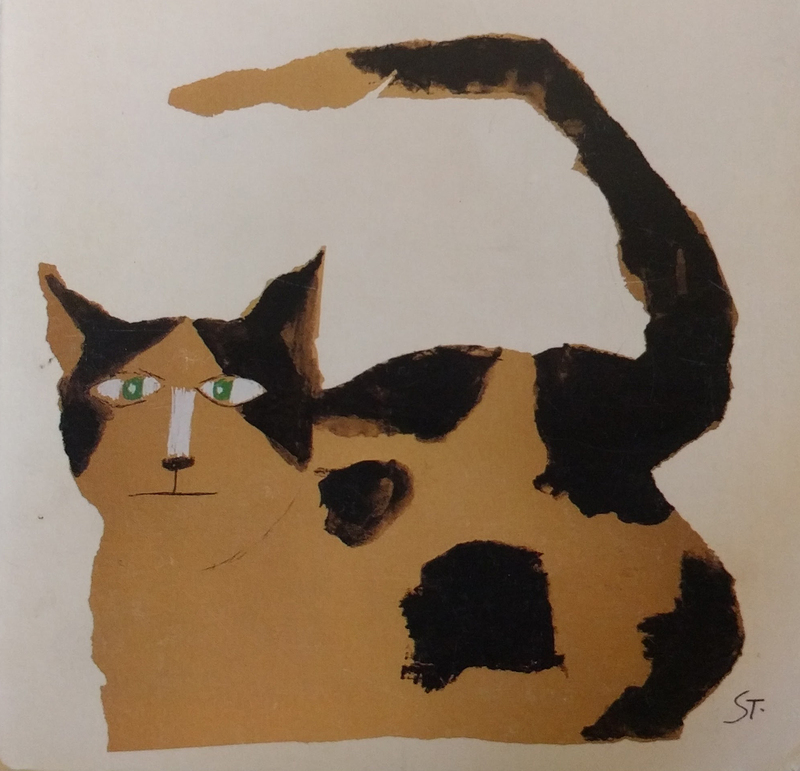 For its original Norwegian release, the publication schedule was much more compressed—something like three years, as opposed to six for the English release. This difference is affecting the way it is viewed—in English it’s being reviewed book by book. Anecdotally, people are also always asking which book is the “best,” or if they have to start from the beginning. Personally, I think Book Two is the best. I have suggested to people that they should start at the beginning, but I also know Book One has put some readers off. I think some readers check out very quickly because of the theme of death and the focus on self. By contrast, Book Three, for example, would probably not put people off in the same way. There is a change of style after the first two books, with Three, Four, and Five being more accessible. So now I would recommend readers dip in wherever. As to the critics, it feels right to me to review each book as it comes out. One a year is slow for those addicted to the series, I know— apologies for that. Considering everything, I guess a series retrospective at the end would make a lot of sense. How would you respond to the argument that the series is too self-involved? I like pretty well all the digressions, the stories within a story. They flesh out what it is like to be a boy and/or a man of a certain age. Readers who are turned off will target Knausgaard’s solipsism, and indeed he does so himself, using that very word in Book Six. He is so honest, so brutal with himself, and it is his project to describe reality as he sees it, so there is no way of avoiding it. Where did you pick up your Norwegian? I learned Danish in Denmark, where I lived and studied for five years. I hitchhiked up the western side of Jutland when I was a teenager and decided I would return at some point. Several years later, after studying Germany and working in Germany and Austria, I applied for a teaching job in Denmark and stayed for five years. I also read Norwegian and Swedish magazines and newspapers. With Book Four now released, how does it feel to you when these translations come out? Is there anything in particular you do to commemorate the release? When the books come out I am intrigued by the response, fascinated by Karl Ove’s interviews. This time a couple of reviews have been positive about the translation, and that has made me feel good. Best of all is that Karl Ove contacts me to thank me. I don’t celebrate when the books are published, but I do when I have finished a book and pressed the magic button! Scott Esposito is the coauthor of The End of Oulipo? He is currently writing a short book on gender to be published next year.